Resurgent domes are encountered near the center of many caldera depressions, and form via uplift of the caldera valley floor due to movement in the underlying magma chamber. Resurgent domes typically host numerous deformation structures that act as conduits for hydrothermal fluids in the shallow crust. Resurgent domes are encountered near the center of many caldera depressions, and form via uplift of the caldera valley floor due to movement in the underlying magma chamber. 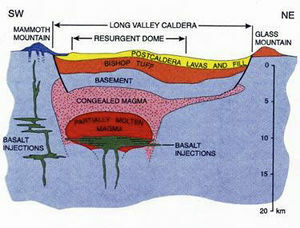 Resurgent domes do not form via eruption of lava, but from the migration of magma in the subsurface that results in deformation of the overlying crust. Resurgent domes typically host numerous deformation structures that act as conduits for hydrothermal fluids in the shallow crust. This page was last modified on 12 April 2017, at 11:19.